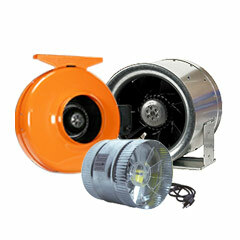 HTG Supply offers the best Grow Room Fans / Ventilation equipment at the lowest prices. 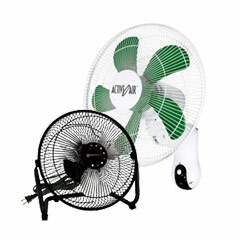 Looking for a top quality Fans for your indoor garden? HTG Supply has a huge selection of Fans and Ventilation equipment for every type of indoor gardener, from beginner to hobby to professional growers. Proper ventilation and air circulation is critical for indoor garden success and HTG Supply has every product you will need. Our High Velocity InLine fans can be used to Air Cool your grow light reflector hoods and also to pair with a carbon filter for effective odor… control. Air circulation fans are used to provide proper air movement typically used to provide a gentle breeze that is essential for healthy plant growth. Inline duct fans / airflow booster fans can be used to provide air movement for temperature control or for other applications that do not require the full output of the High Velocity In-Line fans. Max Fans and Mach Fans move incredible amounts of air for grow room ventilation or grow light reflector cooling. Speed controllers cooling controllers and variable controllers will allow you to control the air movement produced by the cooling fans. 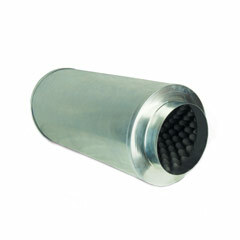 Duct mufflers are used to silence the fans output to just a whisper while still providing massive airflow. 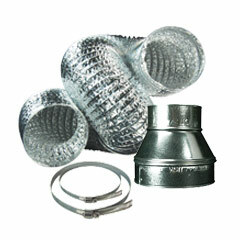 Flexible ducting is used to connect the cooling fans to an outside air source or to connect fans to air cooled reflectors or to connect the reflector hoods together. 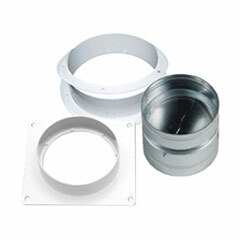 Cooling flanges are used to connect the ducting or fans to your grow tent or grow room with an airtight seal.